This week, I read Half the Church by Carolyn Custis James. I'm not going to go into details about what a total game changer this book is, how much it changed my outlook and inspired me, or how much you should really, really go read it. (Psst- the Kindle edition is still only $1.99.) No, I'm not getting paid to talk about this book- it's just that good. Instead of talking about all that, today I just want to talk about one tiny little point that was mentioned in the book- something that totally grabbed me and inspired me. 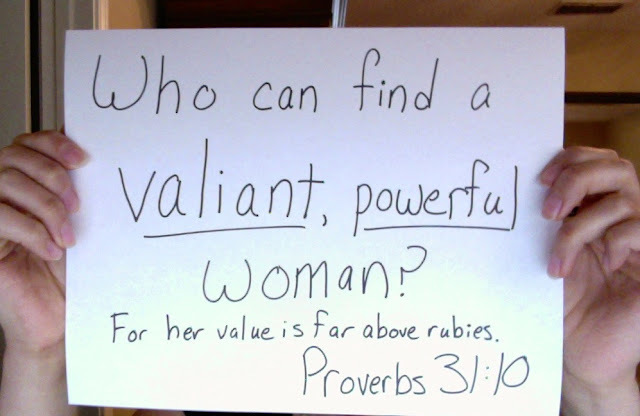 Today I want to talk about the elusive "Proverbs 31 woman". You know, the famed "Virtuous Woman". Virtuous woman- what does that even mean? That's something we all want to be, right? All of those words listed above are definitely things that I want to be true of my life. But what if I told you that the Proverbs 31 woman wasn't actually a "virtuous woman"? What if I told you that when you look at the actual Hebrew words, and not the translator's interpretation of the Hebrew words, this scripture means something totally different? The Hebrew word for the word virtuous in Proverbs 31:10 is the word chayil. While virtue is a very good thing, something that we all want to have, and surely even a word that could have been used to describe the Proverbs 31 woman, it's not the word that was used to describe the Proverbs 31 woman. Chayil means something totally different. According to my Blue Letter Bible concordance, the word chayil means strength, might, efficiency, wealth, army, ability, and force. Wow- that's a bit different from the picture I get when I think "virtuous". Chayil is a battle word, used most often to describe the strength of an army in battle. It's most often translated as "army", and is also translated as the words man of valor, host, forces, valiant, strength, riches, wealth, power, and so on. That's quite a different meaning than the meaning of "virtuous", wouldn't you say? I also asked the readers on my Facebook page what things the word valiant brought to their minds, and while some of the answers were similar to what they said for virtuous, they also said things like courageous and fearless. One person said that they thought that a valiant person wouldn't be afraid to be a voice for those that can't advocate for themselves. Another person said the word brought to mind an animated film about a pigeon in a war(fitting, since Biblically this is a battle word), and another told an inspiring story about how her grandmother overcame many hardships in her life. Cool stuff! Dictionary.com says that valiant means "boldly courageous; brave; stout-hearted; marked by or showing bravery or valor; heroic". Maybe you're wondering if chayil can't mean both things- maybe it could mean virtuous and valiant/strong/powerful? Not only does chayil's definition not have anything to do with the word virtuous, but get this- chayil is only translated as virtuous when it's being used to describe women. Now I'm no Hebrew expert, but even I know that's awful translating- and it also shows the male bias of the people doing the translating. You don't get to change the meaning of a Hebrew word just because it's being used to describe a woman and not a man. If the original author of this passage, inspired by the Holy Spirit, had wanted to describe the Proverbs 31 woman as virtuous, he could have used a word that meant virtuous. But he didn't! He used a word that means strong, valiant, powerful like an army, and he used it to describe not only a woman, but one of the most esteemed women in the entire Bible. So lets read that scripture again, but this time with the proper understanding of the word chayil. I'll try it a couple of different ways, and you can see how these hit you. "Who can find a valiant woman? for her value is far above rubies." "Who can find a woman as strong as an army? for her value is above rubies." "Who can find a mighty woman? for her value is above rubies." Wow! That's such a different picture! This is definitely the kind of woman that I want to be. This translation brings to mind the famous saying, "Well behaved women seldom make history." It takes a valiant, strong, courageous woman to make history- and those women are to be celebrated! The sad thing, of course, is that people, especially church people, tend to be afraid of powerful women. But God says that a valiant, powerful woman is someone to be praised! What if we stopped being afraid of powerful women, and actually started embracing the good that they can bring to the world and the church? What if Godly Christian men accepted, encouraged, supported, and learned from their strong Christian sisters instead of being intimidated by them? What if we raised our daughters with these qualities in mind for their future? What if we stopped telling half the church that they're just supposed to be virtuous, and not also valiant? How much more could be done for the kingdom? Women have so much to offer the world and the church. I think it's high time for the church to stop telling women that their only callings and giftings lie in the home and with their children. We're not called to only be virtuous, gentle women- we're also called to be valiant in battle. "God is shaking his daughters awake and summoning us to engage. His vision for us is affirming and raises the bar for all of us. We cannot settle for less. We have work to do. There's a kingdom to build, and what we do truly matters. Our compass is fixed on Jesus. We can no longer listen to those who call on us to love him with less than all our heart and soul and strength and mind." ~ Carolyn Custis James, Half the Church, p192. Proud Mommy Moment- Hayden's Riding a Real Bike! To the Boy Who Taught Me How to Love.